Picture from just one room of our ever expanding PrintFactory servicing digitally printed contract Trevira cs flame retarding textiles direct and transfer printing. 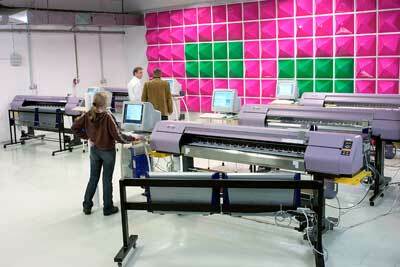 Top quality printing of drapery and upholstery on demand printing. Specialist in Trevira CS flame-retardant contract fabrics in many qualities. Voile / sheer curtain - satin curtain / drapery - plain weave curtain / drapery - upholstery / bed cover and more. 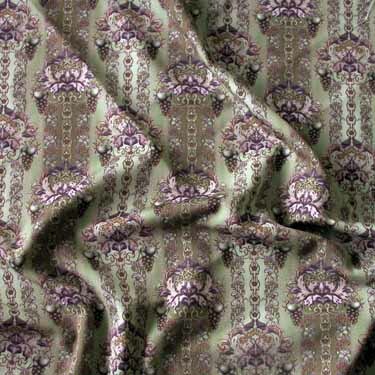 Exclusive designs and production also serviced on your own specified fabrics. Company logo, theater stage design, individual designs and contract collections all on exclusive basis. Supplier to architects, contractors, cooperation's, hotels, retailers, theaters, wholesalers. No printing job is to small or to large. Your files should be Tiff/cmyk/300 dpi. What can be scanned can be printed. No design limitations. Special prices for regular year contracts from average 500 meters a month and up. You do not have to look further for flame-retardant trevira cs contract fabrics digitally printed, we offer the best quality printing value available. World wide fast delivery.